Take advantage of our Maybach s600 rentals now available at Diamond Exotic Rentals Miami. Nestling into the Maybach s600 from legendary luxury automobile manufacturer, Mercedes-Benz, is not like any other experience you can imagine. The Maybach wheelbase has been extended by 8 inches longer than the Mercedes S500 allowing for driver and passengers to have more room inside.The S600 comes equipped with the finest leather finishes, exotic wood veneers and the latest technological gadgets, riding inside feels more like a first class flight than a luxury rental car. On the dash you’ll two high-resolution wide-screen displays that automatically adjustment to exterior light to provide a clear display for entertainment, driving systems, vehicle settings, and navigation controls. The drivers display sports analog-style digital gauges with menus for settings and information. The center display offers intuitive control of all the convenience and comfort features. The car also features a special scent system that disperses will you drive around Miami in style. The Maybach offers a higher state of luxury both inside and out. The performance ratings of the Maybach s600 rival those of other exotic car rentals we offer. There are 523 horses under the hood, powered by the twin-turbo, 6.0-liter V12 engine. If your planning a trip to Miami Beach what better way to get around then to drive the best luxury sedan that Mercedes has ever produced. Many of our customers prefer to use our long-term luxury car rental service with the Maybach. They are so impressed by the interior and power, that after driving it for 2 or 3 days we get a call that they would like to extend the rental for a week. So what does it cost to rent the Maybach? Our Maybach rentals cost $995 per day and includes 100 miles. Each additional mile we be charged at $3 per mile. We do offer better rates for long term rentals if you need the car for a longer period. If renting the Mercedes-Benz Maybach for more than 2 days we offer free delivery to Miami International Airport (MIA), Fort Lauderdale Airport (FLA) or any hotel or residence you are staying. We have several colors to choose from as well as multiple black cars available so if you need two or three Maybachs we can make it happen. 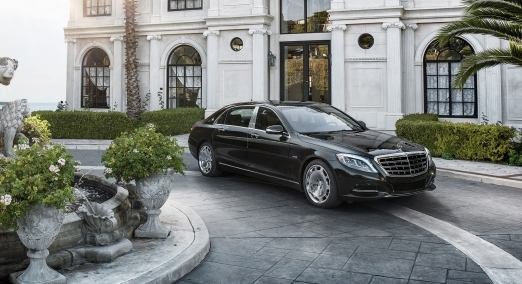 Get behind the wheel of your favorite Mercedes-Benz and rent Maybach s600 Miami today!